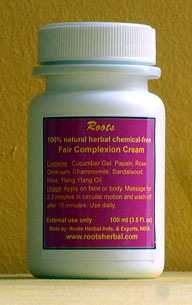 This product is different from our Glowing Skin & Fair Complexion product which is primarily used as a facial. This product is a cream for everyday use. Both products can be used together. Results and Effects: For cleansing and lighting of skin for healthy skin complexion and glow . Made with completely natural ingredients without chemicals or additives. Usage: Apply on face, neck, and body, massage for 2-3 minutes in circular motion and wash after 10 minutes.